One of my fave things about California is all the different climates you can experience within just a 2 hour drive from Los Angeles. Beaches, deserts, snow, mountains - this gorge state has it all. I’m always pining for a lil getaway and this time I set my sights on Idyllwild - a small town nestled in the San Jacinto mountains among the pines. It was my first time visiting and I really fell in love with this beautiful forest village! Especially the Airbnb Eddie and I stayed at. 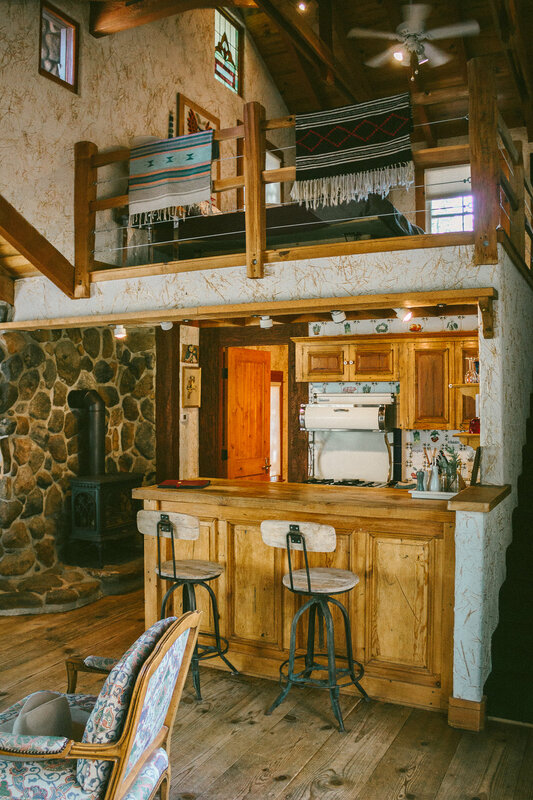 The owners have created such a wonderful cabin sanctuary, and the attention to detail is impeccable. It’s such a special place that we actually spent most of our time in Idyllwild enjoying the cozy home! I mean, can you even? The furniture, decor, all the wood. So, so gorge. Also, get this - when I arrived, the owner was there to greet me with a vodka spritz and fresh wild mint from the forest. Yeah, doesn’t get much better than that. And right when you walk in the door you’re greeted to a wonderful pine fresh cabin smell, thanks to the forest cuttings sprinkled throughout each room. A girl could get used to this tbh. 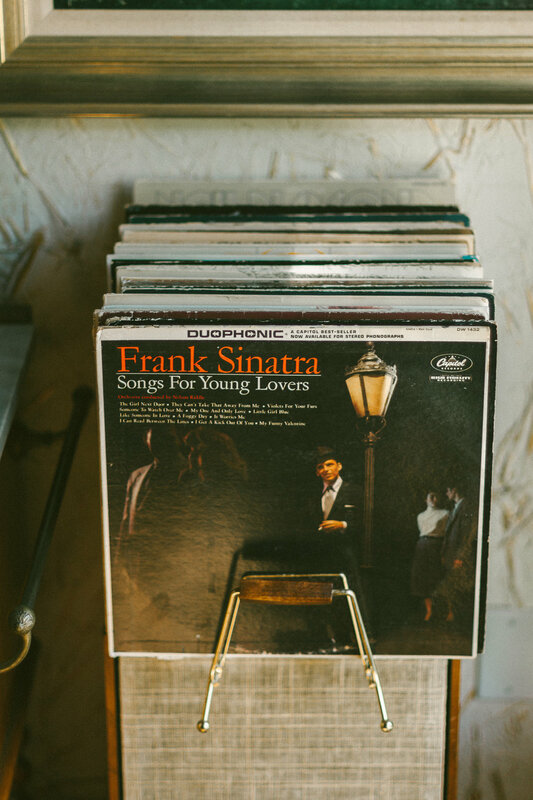 One of my fave parts of the cabin was this record corner. Listening to Dean Martin, Sinatra, and Doris Day on a vintage Marantz record player, sipping cocktails and enjoying the forest scenery from the big picture window was such a delight. La Casita Mexican Restaurant was the dinner spot the first night, and the vibes were super dreamy. Lanterns, bouquets on each table, and twinkle lights, surrounded by all the trees while the sun sets - yas plz, I’m here for it. It’s also is walking distance from the Airbnb if you’re in the mood for a stroll! Afterwards, coming home to our own lil magical patio made me so happy. I’m a sucker for string lights, and sitting out here at night with a bevy and warm blanket was sooo nice. The next morning our hosts (who live in the main house next door to the cabin) brought over warm berry scones they baked fresh in their kitchen, along with organic lattes and jam. (It’s a $20 addition you can add to your Airbnb experience and I HIGHLY recommend it.) I’m not exaggerating when I say these were the best scones I’ve ever eaten. EVER! Nom nom nom. After breakfast Eddie and I went out exploring. The Airbnb property covers 2 acres of land on Strawberry Creek, and right outside the cabin's front door is a beautiful forest filled with boulders, pine, oak, cedar, fir, redwood, manzanita, holly, and more. There’s a a path along Strawberry Creek that takes you right into town, so we hiked through the woods to take in all the sights. After our hike and a little bit of town exploration, it was back to the cabin to relax and chill. The Airbnb is named The Owl Pine, and I love all the adorbs owl decor they’ve sprinkled throughout the place. The bathroom, like the rest of the cabin, is pretty spectacular. Get a load of this green tile shower! Yas plzzzz, love love love! How crazy amaze are these walls??? The straw adds such a beautiful, unique texture. I’m obsessed! The bedroom loft is a cozy lil owl nest. Super comfy king size bed and a ceiling fan to keep things cool. There’s no AC in the cabin but it wasn’t an issue at all - with windows open and the fans going, it kept quite comfortable inside. There’s no TV in the cabin which I actually loved. Forces you to do something more productive and fun with your time. Reading one of the many interesting books they have in the cabin for example, or playing games they keep in the cabinet under the record player. In addition to games and books, there’s a 1960’s Royal typewriter in the cabin, stocked with paper and envelopes for writing letters or love notes. How fun is that? Such a wonderful, relaxing getaway. I highly recommend it for anyone who needs a change of scenery and a break from fast paced life in the city. If you wanna book the cabin for yourself, click here! Have you been to Idyllwild before? What’s your favorite things to do there? Let me know in the comments for our next viz!